"We're happy," Hamilton President Carl Valeri says of the anticipated closing. 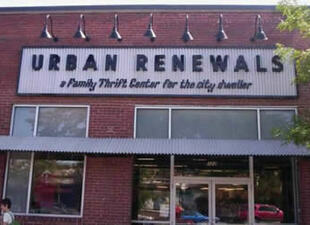 Occupied by a consignment shop, Urban Renewals, the property is secured by a 10-year lease. "They are a very successful company," Valeri says of the tenant. A woman spoken to by phone at the shop tells The Real Reporter that the operation draws from through-out metropolitan Boston. "It's a big store," she relays, adding, "We have a sale every day." Situated next to the White Horse Tavern, there is a Sleepy's mattress unit on the other side of 128 Brighton Ave., a building already owned by the Hamilton Co.
Brighton Ave., featuring a mix of residential and commercial space. As an asset class it is struggling, but retail in Allston's eclectic Harvard Avenue business district always perseveres, says Valeri, estimating rents reaching upwards of $20 per sf, nearly double from the highs at the start of the decade. "It's amazing," he says of the area's performance. The purchase of 122 Brighton Ave. gives Hamilton an intriguing development parcel to boot when combined with 128 Brighton Ave.
opportunity did not materialize, but Dhanda reports he is now chasing a deal in Harvard Square. Known regionally for distinctive radio spots pitching the Neena's Design and Lighting showrooms in Brookline, Newton and Wellesley, as well as one recently opened in Boston's Fort Point Channel, Dhanda declined to offer specifics of the sale of 122 Brighton Ave., as did Valeri. The property is valued at $1.7 million by the city of Boston, Dhanda paid $955,000 for 122 Brighton Ave in November, 1997.